Patients with certain conditions undergo regular diagnostic procedures such as electroencephalograms (EEGs) in order to track their health. Over time, the equipment used to deliver such readings has evolved to enhance comfort and convenience. These advancements have been made possible by chemical engineering and materials sciences. According to a team of researchers in Italy and Austria, electrodes can be made compatible with the skin, and so, they developed a form of temporary tattoo that also acts like an electrode. This setup could possess the ability to read physiological readings through many types of skin, including that covered with hair. Skin-adhering electrodes connect a patient with machines that read and record data such as electrical activity in the heart, brain or muscles in the form of electrocardiography, EEG or electromyography, respectively. These devices consist of electrodes made of high-tech organic compounds. Alternatively, they can also be printed onto paper or with plastics for an ultrathin, comfortable interface with the skin. New-generation electrodes also enhance the disciplines they are used in (known as skin-contact physiology) through improved contact with the skin. Thus, this offers increased access to the bioelectrical or galvanic responses required to assess and monitor health. Despite this, scientists believe that electrodes and their skin-compatibility can be further improved. A team of researchers from the Graz University of Technology, the Human Physiology Section of the Università degli Studi in Milan and the Biorobotics Institute of Scuola Superiore Sant'Anna in Pisa investigated the possibilities of using tattoos as electrodes. In a study led by Francesco Greco of the Institute of Solid State Physics at Graz, electrodes were fabricated by printing material onto conventional temporary tattoo paper. The resulting non-permanent tattoos were then transferred to the skin of study participants. The electrodes were designed with an ethylcellulose (EC) base layer laid down onto the tattoo paper using a variation on ink-jet printing. This setup was surmounted by a layer of poly-3,4-ethylene dioxythiophene polystyrene sulfonate (PEDOT: PSS) to complete a single electrode. The charged conductors could be printed singly or in multiple arrays. A thin strip of gold was used to connect them, and an external connector could also be plugged, if necessary. They were built to have maximal thickness of 1200 nanometres for all the versions, as tested in the study. The connectors, here, consisted of thin wires, whereas conventional electrode connectors were bulkier. Following this, the electrodes were transferred onto skin using water, which removed a very thin layer of starch incorporated in the printouts. Despite this, they were reported to perform well, with an efficacy comparable to that of conventional electrodes (used as controls). The controls were often placed next to or opposite the tattoos on the faces or arms of the study participants. These traditional electrodes were typical gold/gold chloride and titanium, which could be applied to the skin with liquid or gel. The researchers found that the modulus of skin impedance associated with one hour's worth of wearing each electrode type was approximately 94 kiloohms (kΩ) for the tattoo, 94kΩ for the titanium electrode and 102kΩ for the Ag/AgCl electrode respectively. The tattoo electrodes were reported to exhibit superior impedance to the conventional types at various frequency ranges, including that associated with EMG (10 to 450 hertz (Hz)). Their signal-to-noise ratio for ECG readings was also lower compared to the standard, indicating that the former was suitable for use with conventional monitors. A test of facial EMG using a multi-tattoo array and standard electrodes found that the median and mean frequencies recorded were similar. Additionally, the signal-to-noise ratio of the tattoos was (again) reduced compared to the controls. The researchers also reported that the tattoos retained their signal integrity and original layered structure when applied to skin that grew hair. The researchers hypothesised that these innovative electrodes would better be able to conform to the skin than conventional electrodes. Besides, the addition of a gel to enhance contact (as with the Au/AuCl electrodes) would be unnecessary for the application of one of these tattoos. The study showed impedance at various frequencies, which could be similar to the conventional ones. Therefore, the team of scientists asserted that their electrodes were a viable alternative for those that may need to use them, repeatedly, over a prolonged period of time. These electrodes are also reported as ultrathin and as one taking up a reduced surface area (multiple electrodes could fit onto an arm or even a face). 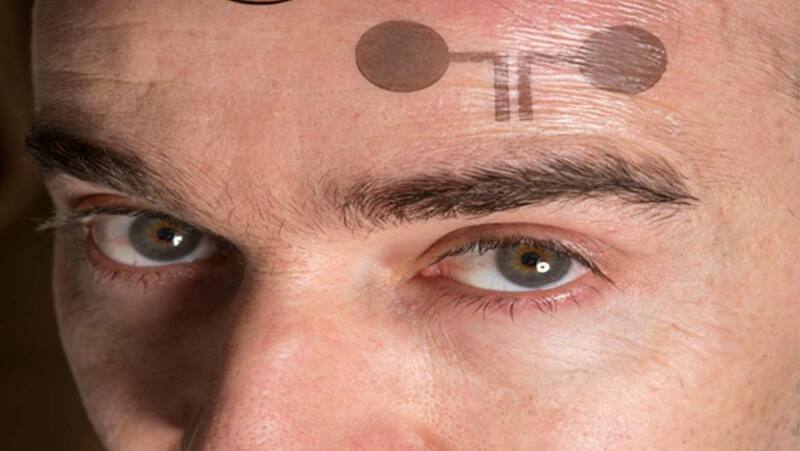 New putative EEG, ECG or EMG electrodes consisting of temporary tattoos can be transferred onto the skin, where conventional electrodes would be attached to obtain readings. The tattoo electrodes were found, through this research, to be comparable to 'wet' or 'dry' varieties of standard electrodes used in diagnosis. The researchers behind this electrode prototype plan to develop the same for use in medicine, sports science and personal health tracking. They also argue that their tattoos may expand the functionality of EEGs due to their conformance with the scalp. Thus, brain-activity readings that are superior to those of normal electrodes can be calculated. In addition, the tattoos may also be readable by next-generation scanners for non-invasive, remote health monitoring. If this works out, we will, someday, be able to sport functional tattoos that keep a closer eye on our health and well-being. Ferrari LM, Sudha S, Tarantino S, Esposti R, Bolzoni F, Cavallari P, et al. Ultraconformable Temporary Tattoo Electrodes for Electrophysiology. Advanced Science. 2018;5(3):1700771. Could A Drug Used To Treat Diabetes Help Sufferers Of Alzheimer’s?